if this is your visit here please make yourself at home! My name is Lynn, I love cross stitch and anything to do with crafts including sewing, making things from felt, polymer clay, card making, calligraphy e.t.c. the list goes on. I have been sewing since I was 7 years old, my love of sewing was passed on to me from my Mother. This year I have decided to make a collection of items that include other mediums besides cross stitch. All you need to do to be in with a chance of winning my giveaway is leave a comment on this post, thats it! The winner will be drawn on 17 th February 2011. My giveaway for 2011 One World One Heart giveaway. The cross stitch pattern for the rose on the scissor keep can be found here at Gazette 94 blog, it is part of the large pattern shown on this page. The design for the rose on the needlebook can be found here from Jennys blog - thankyou ladies for these lovely free patterns. The link to the pattern for the little pouch can be found here, the instructions are in French but they are easy to follow, you will find lots of lovely tutorials for bags on this blog. Welcome to everyone, enjoy your visit! Hi everyone, I hope you are all well and doing lots of stitching! I thought I would give you all a sneak preview of my recent works in progress, the photo above is a freebie pattern that can be found here, there are some beautiful photos of this pattern at this link here where you will find beautiful completed works in this design, the work is truly inspiring. I spent too long checking out the gorgeous photos - be warned they are addictive! Some of you may have already seen the box I made for my friend Hazel, well I decided to make one for myself as I could not resist the bright colours and the gorgeous fabric. If you would like to see Hazels box and contents completed you can see the post here. I am hoping to stitch and finish a giveaway for the One World One Heart giveaway, please check back on my blog on the 30th January, I should have a giveaway ready by that date. I have recently designed a free cross stitch pattern that I am just putting the finishing touches to, I have stitched the design so that you can get an idea what it looks like, hopefully that will be on my blog soon. I am getting a little more organised with my new craft room, the boxes I had stored there have now been cleared and I now have some more space in there to get myself a little organised, I may show you a progress photo soon! More photographs below- click the photo for a close up view. Hi everyone, I have been busy stitching felt strawberries this week, mmmmm do you think they look good enough to eat! I found inspiration to make these from my blogging friend Paulette at Beedeebabee blog here , if you have never been to her blog I urge you to go over a check it out, Paulette makes the most exquisite felt creations! I have seen these strawberries in various forms on lots of blogs and it was always my intention to have a go at making them, but when I saw Paulettes I just could not resist making them right away, they only took a couple of evenings to make, the instructions can be found on Paulettes blog. As you can see I absolutely love strawberry themes, hence the teaset and matching tray. I decided to make the little bag to match, it is made from polyester cotton fabric. 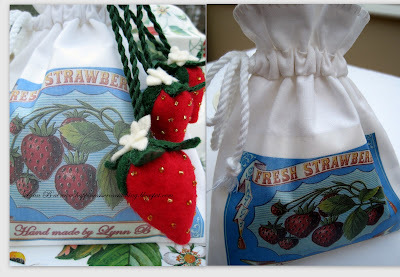 The next time I make this bag I would make the cord out of green instead of white and then I would attach the strawberries to the bag cord but I did not think of that until I had finished it! I decided to pop over to the The Graphics Fairy blog here, to obtain the strawberry picture, Karen has some lovely old photos and pictures that you can download for free, it really is a blog to inspire. I used transfer paper to put the picture on the fabric. The image is printed the reverse way around. You can write words on the photographs by editing the picture in Picasa 3, this can be downloaded free from the internet. If anyone has requested one of my patterns and you have not received a response it is because your emails were set up as 'no reply', please leave me your email addresses and I will send them to you. I would like to welcome all of my new followers to my blog, I really appreciate all of your visits. Hi everyone, I thought I would show you my 2010 finishes. If anyone would like to make a collage like this just download Picasa 3 from the internet, it is a free photo editing tool, at first it may seem a little complicated but if you play around with it you can soon learn how to use it. The photo below shows the gifts I made for Hazel and Yana in our exchanges. This photo shows the exchange I did for Glady's, a birthday gift for Angela, the One World One Heart giveaway and a pink box collection I made for myself. Most of the patterns in this photo are my own design (except the biscornu) you can download them from my blog, I can send the alphabet pattern if anyone would like a copy. This photo shows Little House Needleworks pattern made into a mattress pincushion. The little valentime bag, loveheart pillow and square love pillow are designed by me. The loveheart pillow instructions can be found on my tutorials blog here and the square love pillow is a freebie available from me, just leave a comment asking me to send the pattern to you. The coffee and cream bag and contents was the Mothers Day gift I made for my Mother, I just changed the colours in the valentine set, and the redwork pattern of the lady in the crinoline is a freebie available in a previous post on my blog. This photo shows my Marie Antoinette second blog anniversary gift, a ladybird exchange gift I made for Staci, a gift for Jills birthday gift and some Prairie Schooler ornaments that I have recently finished. This photo shows my Ice Cream Sundae cross stitch, a birthday gift for my friend Diane, a pinkeep gift and a pink box and contents I made for Andrea. Here are a couple of photos I forgot to show, I finished these ornaments in December/January. Here is my Home Sweet Home finish, I am thinking of making this into a flatfold. Phew, thats all my 2010 stitching on display, I do hope you like what I have made, although this year I did not make as many items as I would have liked because of the building works at my house. I will be busy doing other things in January but from February onwards I will be looking to start designing the contents of my craft room, this will involve me sorting through an awful lot of stuff that needs putting back in the garage. I have a chair that I inherited from my dearest Grandmother, everytime I sit in this chair I think of her, she was right when she said it was a very comfy chair, it is great for stitching in. It really needs recovering, that will be one of the things I need to sort out, I will be taking it to a specialist upholsterer as I have no experience in that area! I also have some pine furniture that I will be painting white and giving it a shabby chic look. I have started collecting some things for my craft room, I will show you photos in my next post. Edited: to show correct link for free pattern, just scroll down the page and you find it there! Hi everyone, I found this lovely cross stitch pattern and decided to make it into a little pillow, the pattern is a freebie from this blog here it really is worth checking out some of the lovely projects and the free patterns. Swarovski crystal beads are available on the internet. Happy New Year, christmas pressies and an exchange. Hi everyone, Happy New Year to you all! This year I am looking forward to doing more stitching than I did last year, I have got lots of stitching planned and many projects I can't wait to start. In fact, talking of projects I thought I would show you some of the pressies my husband bought me for Christmas. I also received this craft cutting machine, in addition to cutting paper and card it also cuts small pieces of fabric! I am looking forward to using it when I make projects out of felt. I am still waiting for my Christmas ornament from the Hooked on Exchangng group, I am sure it will arrive sometime soon. I made this ornament for Sadie from Stitching up a Storm blog, this ornament is from a Prairie Schooler pattern. This week I started stitching this pattern again for myself, I have made a concerted effort to stitch everything twice so at least I have a copy of everything I send in exchanges or giveaways. Happy stitching everyone and thankyou for your visits and comments over the year!